With colorful, sandy, and sprawling beaches, quaint inns, elegant resorts, historic hotels and sunny skies – Florida is becoming a hotspot for destination weddings. If you have decided to get hitched in this romantic contiguous destination then it is equally important to spread the word out in a exciting way. Personalized 6x 3 inch love in Florida wedding save the date square corner magnets can be employed for the purpose. 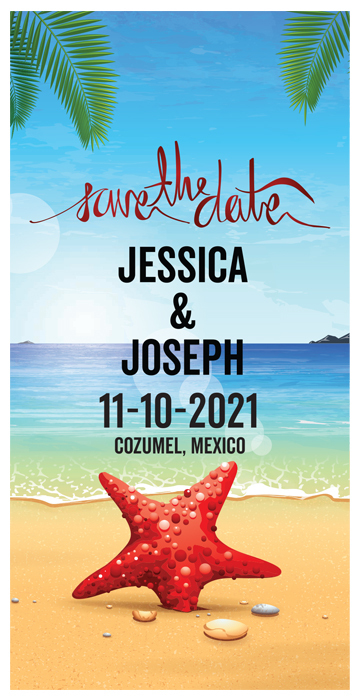 Custom 6x3 inch love in Florida wedding save the date magnet unleashes the excitement and joyousness surrounding a Florida wedding and it pumps their adrenalines with its powerful presence!